I write a lot on this blog about the trouble that litigants and partisans cause for elections officials. That probably has something to do with the fact that I’m trained as a lawyer; because I speak the language of courts, it’s easier to spot how and when litigation (or the threat thereof) is preparing to affect election administration. You can imagine my concern, then, when DailyKos (a well-known Democratic blog) recently had a post by contributor Dante Atkins with the aggressively-clickable headline “You won’t believe what happens in a manual recount.” Normally I resist the siren song of clickability, but a few people I know and trust on Twitter had shared it so I took the plunge. Know what? It’s a terrific piece. I’m a relatively seasoned campaign professional, and I’ve been lucky enough (unlucky, perhaps?) to have already been part of two manual recounts in California. And while election and recount laws vary from state to state (hint: they really shouldn’t), the process is instructive, and provides insights into how we could make our entire voting systems better serve the people they’re intended to: the actual voters. The first thing to understand about any election is that we don’t really have statewide elections or district elections. Instead, we have county elections. Let’s take California, for instance. The secretary of state is not counting any of the votes. Instead, all the secretary of state does is receive the tallies that each one of California’s 58 counties has come up with, and aggregate that result. A statewide election in California really isn’t that: it’s actually 58 separate county elections that are then tallied together to produce an aggregate result. Why does this matter? Because each county’s registrar of voters is the ultimate arbiter of whether a vote in that county gets counted, and that can have some interesting ramifications. [L]et’s think about everything a registrar has to do to ensure that the initial vote count is as accurate as can be. To begin with, every ballot that is cast by mail has to have the signature on the ballot compared to the signature on the registration form. And yes: county registrars have staff members hired seasonally to do these comparisons and verify a voter’s eligibility. As for the poll ballots, the number of poll ballots counted in each precinct has to match with the number of ballots that were distributed and successfully cast by voters, and these numbers have to be reconciled precinct by precinct, and any discrepancies resolved. Further, the number of vote-by-mail ballots counted in each precinct must match with the number that were marked as received by staff during the vote-by-mail period. This process, called reconciliation, ensures that the number of ballots cast matches the number of ballots counted. That’s a painstaking enough process, but we haven’t even gotten to the part about the provisional ballots. In California at least, every voter has the right to cast a provisional ballot. If a voter walks into a polling place but isn’t on the rolls, the voter has a right to declare that they are a duly registered voter and cast a provisional ballot. If the registrar finds their information later, then the ballot is counted–but only for the races in common with where the voter was originally registered. So let’s say that a voter is registered in the city of Pasadena, but moves to Los Angeles, fails to re-register, and attempts to vote at the local precinct in Los Angeles. That voter will not appear on the rolls there, but will be able to cast a provisional ballot. The registrar will find that information later, but won’t be able to vote on any of the local races in Los Angeles that the voter got a ballot for. So how do they handle it? Registrar staff will open the provisional ballot, white out the votes that were cast in the races where the voter was not eligible to count the vote, and let the machine count the rest of the ballot. And this process is repeated, ballot by ballot, for every single provisional ballot that each county receives–which can approach five figures for larger counties in California. 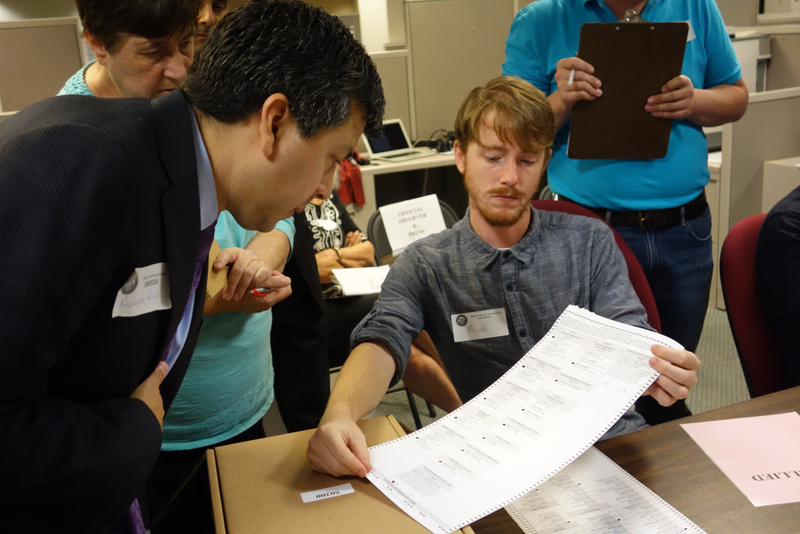 Part of the hand-recount process includes, should the team requesting the recount choose to do so, reviewing each provisional ballot where the votes on the relevant races were voided and ensuring that county elections staff didn’t make a mistake in assessing the ballot type and accidentally void legitimate votes. So what does the adjudication process look like? Ultimately, it’s one person–the county registrar, who has the last word on whether a ballot counts or not–making a determination on voter intent. And there is no law that governs each case, at least in California. There are guidelines that registrars can use as a starting point, but each case is unique. Here’s an example, for instance, from the recount I participated in last week: The machine counted a ballot supposedly cast for the opposing candidate. But upon a hand count review, I saw that the entire side of the ballot on which the ballot was cast had a big “X” mark on it, spanning the entire card. I challenged that ballot and argued to the registrar that with that cross-out mark, the voter intended to void every single vote cast on that side of the card. The registrar agreed with me and voided the ballot cast for the opposing candidate. The registrar could have disagreed with me and said that the voter only meant to void a part of the card, or was expressing frustration and did not mean to void any votes at all. In that case, the vote would have counted. And there are quite a few ballots that have anomalies. Maybe there’s a little bit of white-out on the vote. Maybe the ovule wasn’t filled in all the way. Maybe the voter tried to use an eraser to void a vote and the machine picked it up anyway. The only thing recount teams can do is present their best, most persuasive arguments in front of the registrar, who has the ultimate determination on each vote. And presuming that the requester has enough money to fund the whole thing, this process goes on, day by day, until each legitimately counted ballot has been recounted by hand, and all challenges adjudicated. For anyone (like me) who’s never been in the middle of this kind of recount, this is an excellent read on what it’s like to watch campaigns and election offices work their way through disputed ballots. I’m especially impressed both by how detailed this post is and by the respect for the process that appears throughout. Maybe it’s the holiday spirit in me, but I think that kind of mutual respect is the kind of thing that can pay dividends the next time an election is incredibly close. Thanks to Mr. Atkins for sharing this – and I look forward to the second part discussing provisional ballots sometime soon! Be the first to comment on "You Won’t Believe What Happens When a Partisan Operative Writes About Hand Recounts"